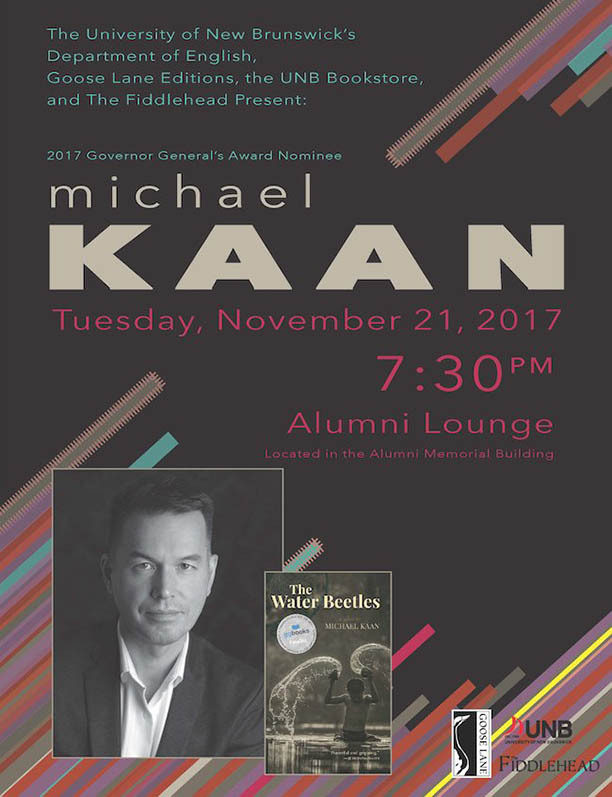 A finalist for the 2017 Governor General's Award for fiction, Winnipeg-born author Michael Kaan’s first novel, The Water Beetles, is a coming-of-age adventure set against the backdrop of the Japanese invasion of Hong Kong in 1941. Loosely based on the diaries and stories of his late father, Kaan’s engrossing narrative examines the uncertainties of adolescence when confronted with the demand for survival. The novel captures the harsh reality of war, and the toll it takes on those individuals whom history often relegates to the sidelines. Rendered in spare, vivid prose, The Water Beetles is a remarkable debut by one of Canada’s most promising authors. This event, sponsored by the UNB Department of English, the UNB Bookstore, Goose Lane Editions, and The Fiddlehead, is free and open to the public.